CLOSE VISUAL ANALYSIS: Nicholaes Maes, "Woman Plucking A Duck"
Nicholaes Maes’ “Woman Plucking a Duck”, an arresting work from the Dutch Golden Age, is located in the Philadelphia Museum of Art. Dating from 1655-56, the work is painted in oil on canvas and depicts a woman sitting in an interior space plucking feathers from a duck on her lap. In this enigmatic painting, Nicholaes Maes’ keen handling of light and darkness, as well as the inclusion of several key motifs in the painting, turns what may seem to be a simple domestic scene into a visually compelling image that plays with my perception of space, hinting at a slightly darker meaning concerning the nature of domestic life during this time. This small work depicts a moment in time brimming with small, suppressed movement. The titular woman sits in the interior space, preparing a duck for cooking by removing its feathers. The clear focus of the work, she is bathed in a warm, radiant light streaming in from the window at the top left of the painting. The rest of the room is largely in shadow. The light moves from left to right along the darkened room, highlighting certain key elements of the painting. By the woman’s feet, a cat eyes another dead duck, ready to pounce. Also on the floor lie several earthenware bowls and other kitchen appliances. Oranges spill out of an adjacent basket onto the floor, creating a sense of movement amidst the stillness. A gun and hunting bag lean against the wall opposite the viewer. Through the window is a peek at a brightly illuminated courtyard; through the door at the back of the room there is a glimpse of another, well-lit room. One of the first signs in this painting that all is not as it seems is that while the woman is plucking feathers from a duck, as indicated by title of the work, there are no loose feathers present in the painting. The painting’s composition is strikingly organized along two diagonal lines that begin at the top left and continue down to the bottom right. The burst of sunlight coming in from the window, as well as the arrangement of the woman, the cat, the bowls and basket, and the fruit, form two strong diagonals that are parallel to and echo one another visually, unifying the composition. Maes uses one-point linear perspective to fully create the depth of space in this domestic interior. The lines in the floor and the top of the windows above the woman’s head serve as orthogonals that converge toward the shadowy back of the principal room. However, Maes subverts total faithfulness to a realistic interior setting by slightly warping the shapes of the bureau and gun on the left side of the room, providing one of several visual clues that all is not as it seems in this home. The painting is characterized by a restrained color palette, consisting of shades of brown, off-white, brick red, with dashes of dark green placed throughout. 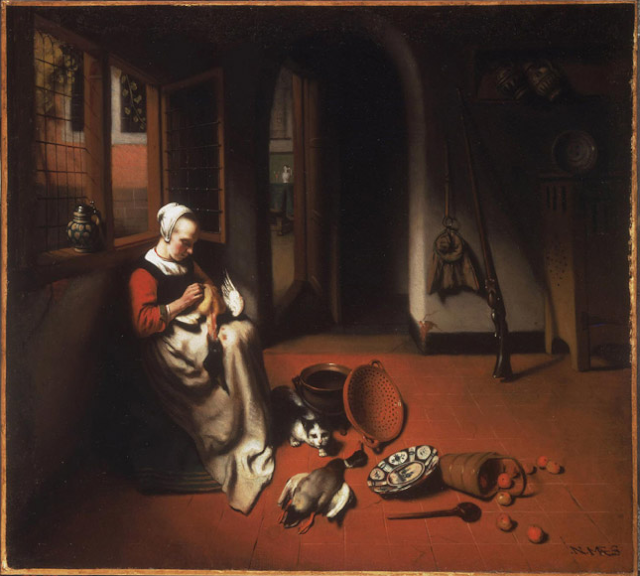 The dominant color in this work is a rich brick red, which appears in variant shades in the floor tiles, the woman’s sleeve, one of the earthenware bowls on the floor, the oranges, and the wall in the courtyard visible through the window. This reddish hue serves to unify the composition and bathe the setting in warmth as well as to remind me, as the viewer, of the bloody deed preceding the scene depicted (the killing of the ducks). The use of white and its related shades is also notable in that their placement throughout the setting serves to flatten the space and to subvert depth created by the use of linear perspective. The brushstrokes in the painting fluidly and confidently describe the different textures of the bowls, the clothing, the floor tiles, the metal of the gun in the corner. The figure of the woman is dimensionally modeled and, while idealized to a degree, is naturalistically treated. The lighting scheme in the painting organizes the space in a way that is visually striking even at a casual glance. Upon closer inspection, the way the lighting organizes the space is not wholly naturalistic and thus creates a sense of unease. The foreground of the painting is largely illuminated while the middle ground and the back of the room are cast into shadow. Oddly enough, the room viewed through the door, behind the darkness, is brightly lit with the aforementioned shades of white, which projects that space forward and compresses the overall space. The way Maes has organized this interior world is thus deliberately awkward. This subversion of atmospheric perspective creates an almost otherworldly air and makes me feel trapped within the surface of the painting, giving me an almost anxious feeling when I look at it. The objects placed in the room also hint at the painting’s slightly darker nature that subverts the seeming placidity and tranquility. The presence of the cat lurking by the woman’s feet, waiting to pounce on the other dead duck, introduces an element of violence that is further echoed by the presence of the gun. There is a deliberate intrusion of violent, disruptive elements into this quiet, intimate domestic scene. The presence of the gun is a deliberate reference to the violence that begat the ducks the woman is preparing, a violence echoed by the predatory manner of the cat. The angle of the woman’s head leads the viewer’s eye to the lurking cat, indicating the importance of this sinister inclusion. The lighting of the objects in the room also adds to the meaning of the work. Even in this seemingly peaceful home, this painting says, violence and anxiety are inescapable. The placement of the viewer in relationship to the scene also reinforces the feelings of unease and adds a sense of voyeurism, leading me to question the role of the viewer in this work. Based on the way the room is lit, the viewer would be beyond the picture plane, in shadow, quietly watching this moment in time. Already I, as the viewer, am thrown off-balance by the compression of the interior, caused by the contrast between the bright light at the back of the scene and the dark shadows at the foreground. The viewer sees the gun and the cat in context of the setting, but is powerless to stop the violence they represent.